Palpation of the spleen is more difficult than palpation of the liver. The patient lies on the back, with the examiner at the patient's right side. 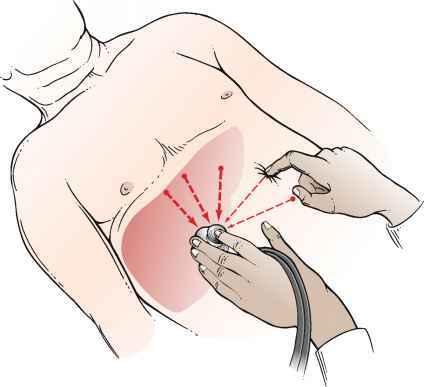 The examiner places his or her left hand over the patient's chest and elevates the patient's left rib cage. The examiner's right hand is placed flat below the patient's left costal margin and presses inward and upward toward the anterior axillary line. The left hand exerts an anterior force to displace the spleen anteriorly. Figure 17-27 illustrates the positions of the hands for splenic palpation. Figure 17-25 The scratch test for determining liver size. The patient is instructed to take a deep breath as the examiner presses inward with the right hand. The examiner should attempt to feel the tip of the patient's spleen as it descends during inspiration. The tip of an enlarged spleen will lift the fingers of the right hand upward. Figure 17-27 A and B, Technique for splenic palpation, with patient lying on the back. Figure 17-28 Another technique for splenic palpation, with patient lying on right side.